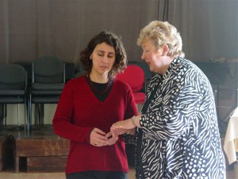 Professor Susan McCulloch FGSM ARCM (Hons)- is the principal voice teacher at Classical Voice. The international soprano Susan McCulloch’s solo career spans all fields of the classical music world. She has sung –amongst other places- at the Glyndebourne Festival, ENO, Chatelet in Paris, de Nederlandse Oper in Amsterdam, New Year Opera Galas at the Royal Albert Hall, international opera performances as Tosca, the Countess, Marcellina, Leonora etc, with such eminent colleagues as Sir John Eliot Gardiner, Sir Charles Mackerras, Mark Elder and Bryn Terfel, to name but a few. Wide varieties of concert and oratorio work as a Principal Guest Soloist took her all over the UK, extensively across Europe, the USA and the Far East, including such works as The Four Last Songs, Mahler Symphony Nos. 2, 4 and 8, Beethoven Symphony No. 9, Handel’s The Messiah, Wagner’s Wesendonk Lieder – and a great specialism of Opera Gala Evenings. A testament to her artistry and likeability is that in almost all cases her singing led to invitations to return for future performances. She also has an extensive television and recording catalogue that includes several episodes of Inspector Morse, Closing Numbers, the Marriage of Figaro and Opera Karaoke! Running parallel to her career as a solo performer, and exclusively latterly, she has established herself as a sought-after vocal teacher of considerable note. Susan was invited to become a Performance Consultant at the Royal Opera House “Jette Parker Young Artists Programme” and is a Professor of Voice at the Guildhall School of Music & Drama as well as a founder tutor on the Abingdon Summer School for Solo Singers and has rapidly acquired a reputation as a knowledgeable, enthusiastic, energetic and likeable teacher, lecturer and masterclass-giver both within the Conservatoire environment and at advanced level national and international vocal summer schools. She is also in much demand abroad where she is noted for her informative, enabling and good-humoured Masterclasses and also adjudications of Festivals, Competitions and Singing Prizes. She is able to give constructive and helpfully critical comments, understanding sympathetically how singers feel.Susan’s students can be found amongst the most prestigious competition prizewinners as well as singing at the highest levels in the UK and abroad. She is particularly proud that in recent years two of her students have been first prize winners at the major Kathleen Ferrier Competition and four of the last five Gold Medal Prize Winners at the Guildhall School of Music and Drama have been her students; their success endorses her stellar reputation in advanced vocal teaching and coaching. Susan’s students can now be found performing in the opera houses and concert platforms throughout the world. Susan blends her own considerable performance experience, knowledge, humour and communication skills, to evolve a way of teaching and coaching that takes into account both the levels and demands of the individual student and her knowledge of the standards necessary to succeed in this business. She is also in great demand to give Masterclasses throughout Europe and to judge Music Competitions at all levels - and is absolutely passionate about her work as a Teacher of Voice, believing strongly that the only form of good knowledge is shared knowledge. Susan speaks fluent French and is conversant in Italian, German and lightly in Portuguese and Dutch. On the lighter side, her hobbies include cookery, card-making, theatre, cinema, golf and France.